Welcome to the Contracting Business reader service Web site. 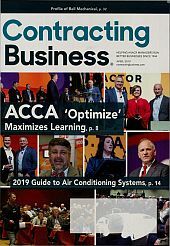 Use these pages to quickly find and request free information on the products and/or services found in the pages of Contracting Business. You can ask companies to provide you with more information or link directly to their web site. BF Goodrich DEADLINES DON'T INCLUDE DOWNTIME. TESTO INC Testo 550, 557 or 570 Digital Manifold! Verizon Connect A total fleet platform to move your business forward. ATTIC TENT INC Always get the best! ELITE SOFTWARE Over 20 HVAC Design Programs! SAWIN SERVICE AUTOMATION INC Mobile Integration!